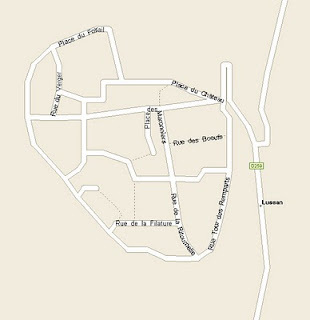 Continuing our southwesterly ride across southern France, my Main Squeeze noticed another of those tiny knots of streets a mile or so off to the north, this one going by the name Lussan. Ready for an afternoon break, we made the short diversion and parked in a field set aside for that purpose at the foot of the steep climb up into town. Lussan has a population of 365, plus or minus a few, and seems to have survived for no other purpose than to amuse and delight visitors. The population actually peaked in the 19th century at about 1600, with silk being the major industry. The valley was filled with mulbery trees and silk worms ruled. Imports from French overseas possessions crippled the trade by the beginning of the 20th century and WWI finished it entirely. Although the entire village is less than 250 yards in diameter it has lots to offer the curious. See here for some sights around town. 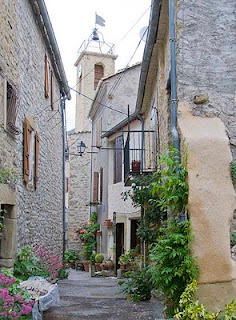 Bagnols-sur-Cèze is a regional center on the Cèze river in the Languedoc-Roussillon region of southern France. From a Roman settlement developed for its baths, by the 13th century Bagnols sported a central arcaded square, now called Mallet Square, and was granted a regional market in 1223 that helped consolidate its growth. Now a town of more than 18,000 people, the market is still held every Wednesday and its fortunes were further advanced in the 1950s when the Marcoule nuclear center was created close by. A mile or so outside town is a well organized campground with a store, a swimming pool and shaded casual sites on the bank of the Cèze. A most enjoyable couple of days in a friendly and compact town. 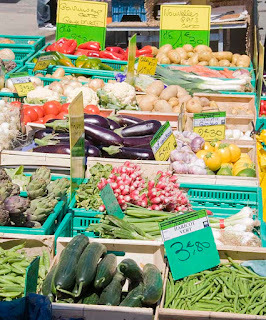 For some market pictures, click here. Trolling along the D17 we noticed a 10 feet high sloping wall obscuring our view to the right. Some serious fortifications we thought, gotta check this out. 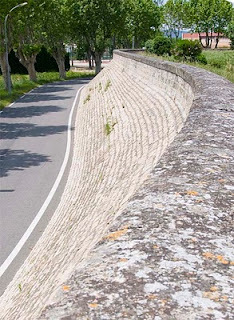 We traced the wall by turning right whenever possible and, after 270 degrees of such turns began to believe there was no opening at all. Finally, near the northeast corner, we came to the first of two openings, each of which were equipped with massive sliding gates. Once inside the mighty wall, we found ourselves in Caderousse, a village of 2,500 inhabitants, built in a former loop of the River Rhone. We shortly learned that the defensive wall was not for military security but was actually built in 1856 to protect against the foolhardy choice of location that visited frequent flooding on the entire area. The Town Hall, built in 1752, serves the secondary purpose of a depth gauge memorializing the extent of various floods. Beyond a Post Office and a couple of stores, there were no other signs industry or commerce in the village. More pictures here. Mooching along the D994 road on the way to our next destination we spied a tiny village on a hill and promptly swerved off the road into a narrow lane to check it out. Turned out that this was Rosans, a village dating back to Roman times, with a current population of just over 500 souls. 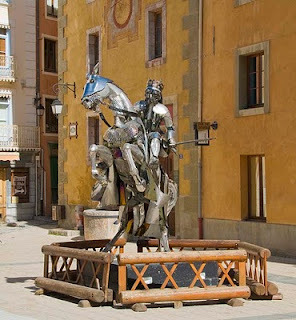 The area is known as The Baronnies and is thought to have been populated, in large part, by retiring Roman soldiers who were granted small parcels of land - an early form of a pension one supposes. Until quite recently, the area population had been in decline for several centuries due, it seems, to harsh winter weather and a paucity of economic opportunities. Its recent "rediscovery" by holiday home buyers has possibly stopped or even reversed the depopulation trend, as the Mercedes set move in. By and large, Rosans is quite rundown although the stone buildings have survived the lack of maintenance remarkably well. There is an active church in the surprisingly large main square and a bustling cafe in another corner, populated by wine quaffing yuppies. Like other locations in this rustic area of France, Rosans enjoys an average of 300 days of sunshine each year while the altitude of 2500 feet or so, keeps the temperature pleasantly cool in summer. Click here for a quick tour. In 14 BCE, Augustus, the Emperor of Rome, seized the town that is now Gap from the Gauls, who originally founded the place. In turn, the French Crown annexed the city in 1512 CE and it has been part of France ever since. 2400 feet up in the Alpine hills, Gap has a population of around 36,000 and sits at the crossroads of the D994 and the N85. The city has applied to host the 2018 Winter Olympic Games. A digression...The N85 is known locally as Route Napoleon from the time that Napoleon I traversed the path as an escaped exile in 1815. In 1814, Napoleon Bonaparte was banished by the Sixth Coalition to house arrest on the island of Elba off the Tuscany coast of Italy, close to his birthplace, Corsica. Early the following year he made good his escape back to mainland France and embarked on his final odyssey to Waterloo in Belgium. Accounts vary as to the size of the entourage he gathered - somewhere between 50 and 1000 men it seems - but the little fellow and his gang covered 200 odd miles of rugged terrain in just one week to arrive in Gap on March 15, 1815. Here, he printed and distributed thousands of copies of his Proclamation before traveling on to his ultimate defeat at Waterloo in June of the same year. 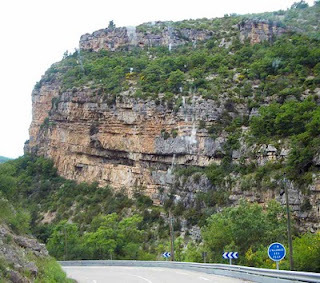 An historical highlight for Gap at the time and the establishment of a popular tourist route along one of the most spectacular lesser highways in France. Elsewhere in Gap is the Roman Catholic cathedral - Cathédrale Notre-Dame-et-Saint-Arnoux de Gap - a national monument of France. The current cathedral was built between 1866 and 1904 in Neo-Gothic style by architect Charles Laisné on the site of a former medieval cathedral. See here for more pictures. 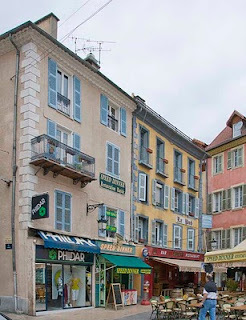 Just three miles west of La Vachette is the vibrant city of Briançon. 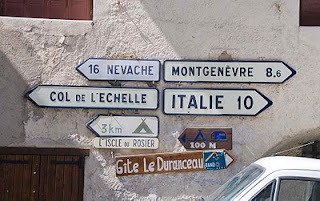 Built at the confluence of the Durance and Guisanne rivers, its function as an Alpine crossing point between France and Italy fairly guaranteed its historic importance in medieval times. Briançon enjoys an average of 300 days of sunshine each year and, at an altitude of around 4,000 feet, it is the highest town in the entire European Union. 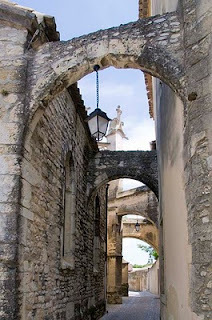 Today there are essentially two cities - the upper one that preserves the 17th century Vauban fortifications and the lower city that extends along the banks of the River Durance and contains, among other features, the market. Total population is around 12,000.Briançon was granted municipal privileges by a charter signed by Dauphin Humbert II in 1343. In 1692 Louis XIV's omnipotent military engineer Vauban, reinforced the town walls and began a sequence of fortified extensions further and further up into the mountains. This trend actually continued into the 1930s when Briançon became part of the Maginot line in preparation for WWII.Two of the major streets in the old town have a sizeable gutter running down the center, known as gargouilles, that originally carried effluents down to the rivers.This less than attractive cargo has since been replaced by wholesome mountain water. 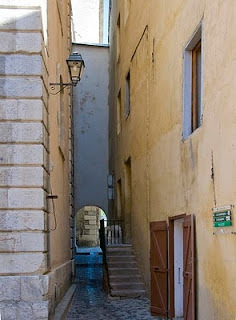 Only one other town in France - St Martin-Vésubie in the Alpes-Maritimes - has a similar feature. If you ever find yourself in this part of France do give Briançon a look. To see more now, click here. After departing Turin we enjoyed a refreshing ride over the Alps, climbing out of Italy and then descending into France. 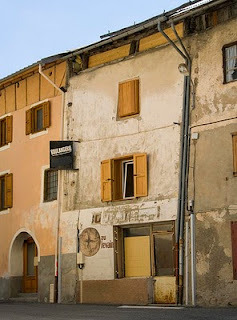 La Vachette, a tiny and, as we were to discover, close to derelict village in the Briancon, Hautes-Alpes, Provence-Alpes-Cote dAzur region was our objective. Following a couple of dead ends we stumbled onto the intended campsite and parked up for the night. A quick walk around the remnants of the village confirmed that La Vachete was a waypoint and definitely not a destination! Even the Boulangerie was shuttered - a sure sign that death is close at hand. The stopover was considerably brightened by the arrival of three, late 1950s AJS motorcycles during the evening. These, along with three English drivers, two passengers and their tiny tents, were on their way to the annual AJS rally being held in Italy. AJS (A J Stevens) motorcycles were originally manufactured close to my hometown in England. During the sixties, AJS combined with Matchless Motorcycles and Villiers Engines to form Associated Motorcycles as a last ditch, and ultimately unsuccessful stand against Japanese competitors. Nice to see. For more picture, click here.